Cover is 11 in. x 11 in. outside tile size - fits outside tile dimensions from 9 3/4 in. x 9 3/4 in. to 12 in. x 12 in. This Hy-C Company Draft King 11x11 single flue chimney cover features the durability of 100% galvanized steel, a 24 gauge single piece galvanized steel hood featuring scalloped corners and a drip edge, an 18 gauge 3/4 in. expanded galvanized steel mesh, as well as a 14 gauge galvanized steel base that provides added strength. 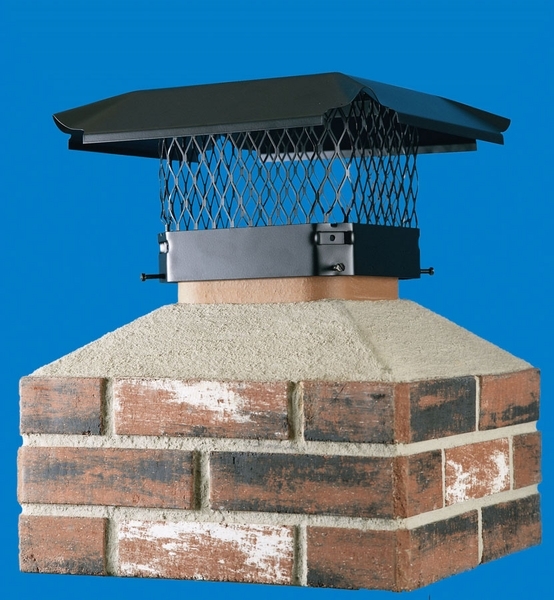 The Draft King chimney flue features a slotted hex-head mounting bolts and the outside mounting of this Hy-C company chimney cover creates more free air space for a better draft, and the expanded metal mesh is turned inward at the base so that the cover rests firmly on the tile and closes any openings around the tile. Delivery was on time and easy to install. The product is well made. This chimney cover fit perfectly, it mounted solid and keeping the rain out of the chimney pipe. The chimney caps look great and fit easily onto my flues. The adjustable mounting brackets make installation extremely easy. I installed 3 caps in less than 30 minutes. ProsSolved the problem of insufficient exterior clearance of flue by tension legs on the interior. ConsDirections not clear. I had to try a few alternate methods before success. Well built and easy to install this chimney cover was just what we needed. ProsWell Built. Lots of room for adjustment. ConsFastening bolts are a bit too long. Not only did this product meet all of the expectations we had in reading the advertisements, but also it managed to exceed them. The one minor issue is that the instruction manual did not specify what the socket wrench size for the installation process needed to be. Otherwise, installing it was easy. This rain cap was extremely straightforward to install. It is quite effective. We are very thankful for this excellent product. Not only did it arrive promptly, but also it has proven to be much better than we would have ever envisioned it to be. This cap has definitely lived up to my expectations and is much better than I had anticipated. This was incredibly easy to install. This product was an incredible buy that was quite easy to install. If a need to buy another one at a later date, I would not hesitate to purchase this item all over again. It is simply a terrific buy.